If the last one isn’t satisfied, say, she wanted it for her OWN party and could demonstrate that she would be returning it AFTER the party, would there be a separate charge? I would guess that it’s not time specific. 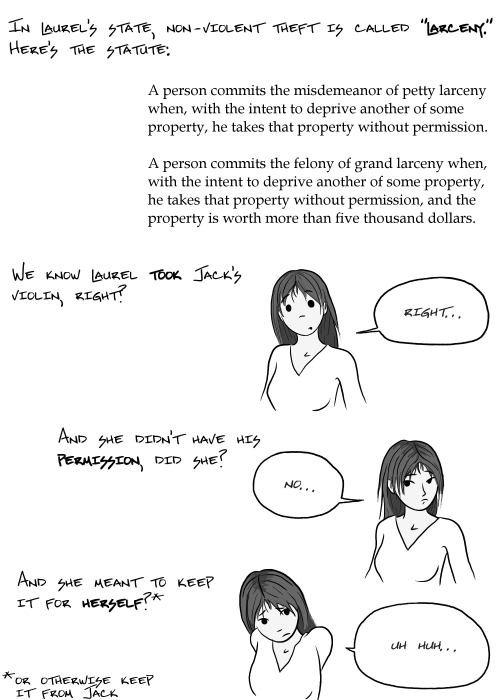 Intent to deprive someone of their property for a week would still be the intent to deprive them of their property. The clause is there to establish mens rea, I suspect. If you took their property because the backpack they had stuck it in looked like yours, you didn’t take it with the intention to deprive them of it, you took it because you were mistaken about the facts. If you took it knowing it wasn’t yours, you had the intent to deprive them of their property. You could also have taken their backpack with the intention of putting it in the “lost and found” pile, or with the intention of running after them to try to catch them before the bus leaves. Then you would have been taking someone else’s stuff intentionally, but not with the intent to deprive them of it. Umm… actually… She didn’t take it to deprive him, she took it because she liked it. Based on her thought bubbles, a duplicate would have been just fine. Oh, and free. Is this one of those cases where the phrase has a specific meaning to the legal profession?